What should a test member do? Important: Predictive AM requires that you send a test email to at least one test member. As indicated above, sending a test email to yourself or your test group is a required step in the edition creation process. You can send as many test emails as needed before sending the email to your campaign members. From the eMaker editor, click the test icon and select the ‘Send Test to Me’ option. The default email address displayed will be for the logged in user. Change as needed. Using the ‘test to me’ test option will test the visual appearance of the email, and not the functionality of merge fields and link tracking. Information: If the email address used is also associated to a campaign member, Predictive will not re-send the email when your campaign starts sending. Reference: Click here for information on creating global or campaign only test members. From the eMaker editor, click the test icon and select the ‘Send Test to Group’ option. The default test group PAM will be pre-selected. All members marked as test members in the campaign are sent the email edition. 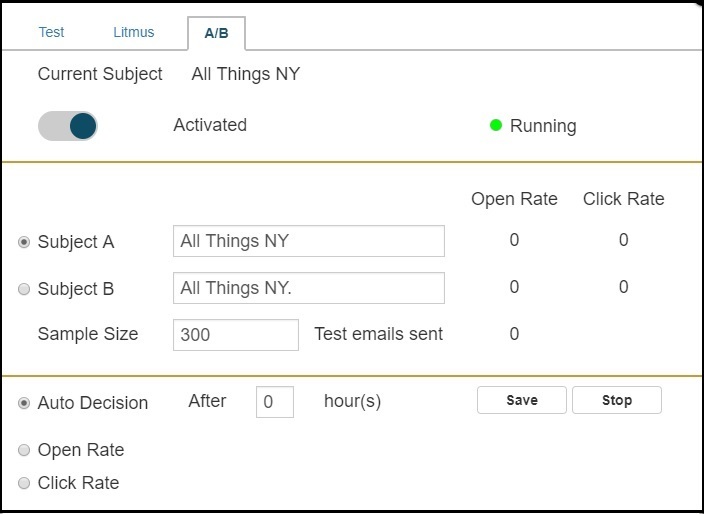 Using the ‘test to group’ test option will test the visual appearance of the email, as well as the functionality of merge fields and link tracking. Review the content: They should ensure that the message is correct and that there are no errors in grammar, etc. Click the links: If you have added links to your content, all links should be clicked to not only confirm they open to the right page and that the clicks are tracked. Important: The Predictive tracking codes have to be added to your web site and the links, when added to your email content, have to be setup correctly. Reference: Click here for information on the Predictive tracking script. Reference: Click here for information on setting up links in your email. Insight tests have two parts – one component allows you to see what your email content will look like in over 30 different email inboxes. The second component runs your email content through over 50 spam filter and lets you know if there is a chance of your email going directly to a spam folder. If the content does not pass the test, the application provides you with the information you need to lessen the possibility of sending a spam message. To start an Insight test, click the Run Insight icon. As the popup message indicates, the test may take a few minutes as the application collects the screen shots and spam filter results from the different email clients and spam filters. To view the results, click the View Insight icon. Here you can see thumbnail versions of your content. Click on a thumbnail to enlarge the view. Click the Spam Analysis button to see if your content has passed or failed for each filter listed. Click show details to view the information you need to correct your content – if desired. Insight is a Predictive add-on application. Access to Insight is dependent on the Predictive package purchased by your organization. If you see a message indicating no tests available, contact our Support team. Click here to complete a support ticket. Using our A/B Test feature can increase your open rate by approximately 20%. The A/B Test lets you test different subject lines on small portions of your campaign members. Create your subject lines and let Predictive do the rest. To start an A/B Test, click the Test icon and locate the A/B tab, in eMaker and in the Classic editor. Information: Every edition in a campaign is assigned a unique identifier. Predictive retains the data indicating which editions have been sent to each email and will not resend the same email to a member that has already been sent the edition.